Dry beans now cook in less than an hour. <–I’m writing this while chickpeas cook in the Instant Pot for dinner. Chicken stock is ready in just a couple of hours. This means I can make stock and soup on the same day, using the same pot. And I have more time to enjoy the evening with my family thanks to the hands-off, one-pot nature of Instant Pot dinners. I’m an electric pressure cooker convert. Maybe more of an enthusiast at this point. That’s something I never thought I would say…. There was a time when I feared this appliance. The thought of a pressure cooker exploding on my counter was enough to keep me from even opening the Instant Pot box for over a year. Just think of how many bowls of soup and quarts of chicken stock I could have made during that time. Travesty, I know. Fear held me back. Back to the Instant Pot, and today’s recipe which you’ve probably guessed is made in the Instant Pot or your electric pressure cooker of choice. 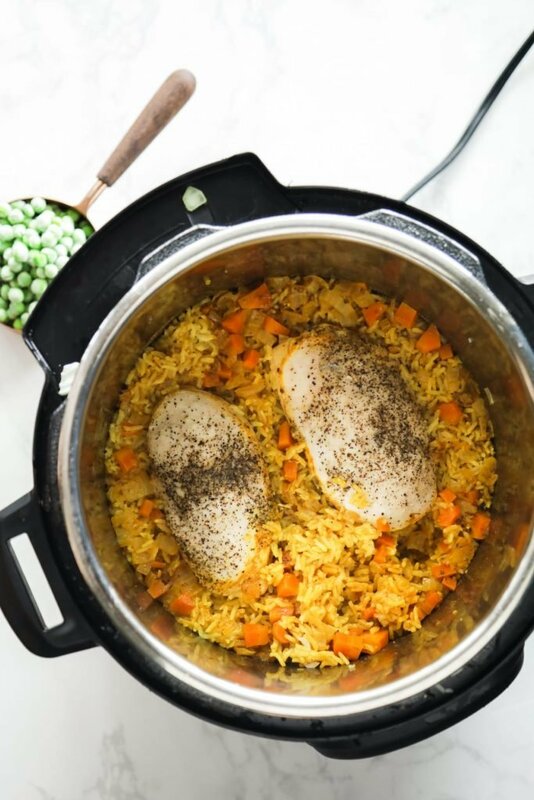 This Instant Pot chicken and rice recipe is as easy as a dinner recipe can get. It’s truly a one-pot, dump the ingredients and forget about it kind of meal. That’s the kind of meal that I need in my life around this time of year (#endofschool). Okay, let me be honest. That’s the kind of meal I need in my life all year. This meal has been my go-to on Wednesday nights, our busiest day of the week. With this meal, I don’t have to worry about adding anything to the slow-cooker in the morning, or mixing together any ingredients before heading out for the day. 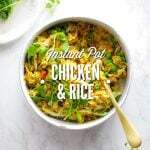 When we get home from work/school/life/karate, the simple ingredients are added to the Instant Pot and within 30 minutes a nourishing dinner is ready to be enjoyed. A dinner that’s enjoyed by the whole family. 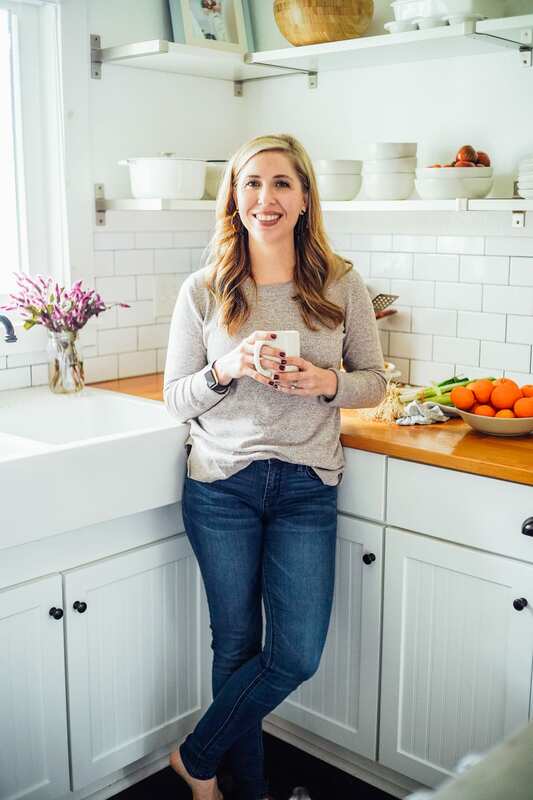 Remember when we talked about simplifying real food with a capsule pantry? This meal is a perfect example of a capsule pantry meal. With just a few simple, multi-purpose, nourishing ingredients, a quick and easy meal can be made at home. The same ingredients can also be used to create so many other meals. That’s the beauty and simplicity of a capsule pantry. 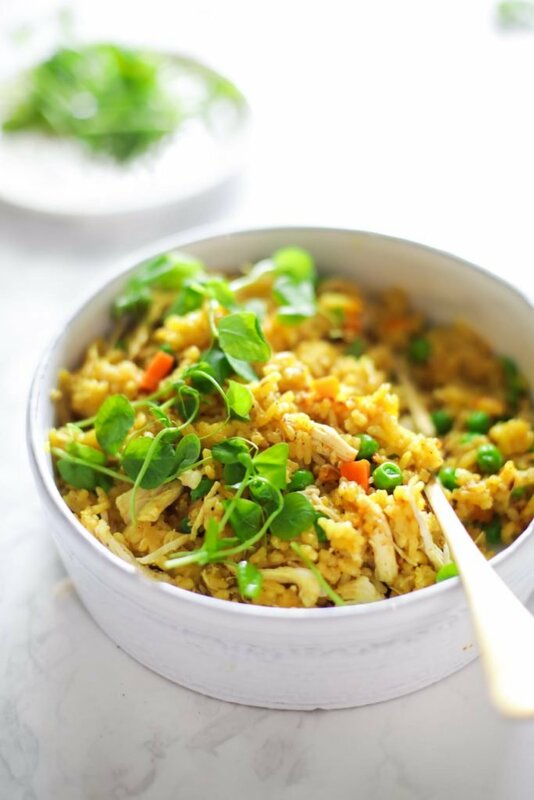 This Instant Pot chicken and rice recipe is as easy as a dinner recipe can get. It’s truly a one-pot, dump the ingredients and forget about it kind of meal. Sprinkle the chicken thighs with a few pinches of salt and pepper. Set aside. In a small bowl, whisk together the paprika, turmeric, oregano, cumin, salt, and pepper. If you’re not using fresh garlic, also add garlic powder to this mixture. Add 2 tablespoons of oil to the Instant Pot. Make sure the oil evenly coats the base of the pot. Turn on the Instant Pot to Saute, Normal. Once hot, add the onion and carrots. Saute for 3-4 minutes. Add the garlic and saute for another minute, until fragrant. Add the seasonings and stir to evenly coat the veggies. Press Cancel to turn off the heat. Add the broth or water, 1 tablespoon of oil, and rice. Stir to combine the ingredients. Place the chicken thighs on top (do not stir). Secure the lid and set to Sealing. Set the Instant Pot to Manual, High Pressure, for 8 minutes. Once the rice is done cooking, let the pressure release naturally for 10 minutes before releasing the remaining pressure (use a hot pad holder or towel) and opening the lid. Shred the chicken with two forks. Fluff the rice with a fork. Add the frozen green peas and stir to combine the chicken, peas, and rice. Serve once the peas are warm/room temperature. Made this tonight and loved the flavors! Awesome, Helen! So glad you loved it! I love this kind of recipe as it is so easy and flavorful. I added red peppers (because I had some) and forgot to add the peas as the kids were waiting patiently and couldn’t wait to eat because it smelled so good. Always use boneless/skinless chicken thighs as it stayed so moist in the recipe. Thanks for sharing Kristin! Thank you, Terry! So glad you loved the chicken and rice! Can you use brown rice? 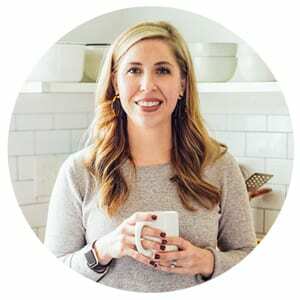 I’ve just found you thru a search for Instant Pot recipes. Love everything about this one! I have the Mini Instant Pot. What size are your recipes made in? Thanks, Rachel. That’s very helpful. I think I can make adjustments for my “Mini” pot. Thank you, Barbara! I hope you enjoyed the chicken and rice! This looks so delicious! Can’t wait to fix it this week. We attempted this recipe tonight, and are now finishing the cooking in the oven as the Instant Pot gave us a Burn notice. There was nothing between the heating element and the pot outside, nothing wrong with the seal or the valve. We followed the instructions exactly, even though the amount of liquid to rice seemed wrong. Rice needs twice as much liquid as the amount of rice, so only 1 3/4 cup of broth to 1 and 1/2 cups of rice (and yes, we washed it thoroughly) is just too little, it seems to us. We’ve successfully used the Instant Pot for a number of other recipes, so we’re wondering what could have gone wrong. I’m not 100% sure what may have caused the burn warning. One thought is that there may have been browned bits of veggies stuck on the bottom of the liner from the initial saute–this can cause the burn notice to come on since the Instant Pot thinks the food is burning on the bottom. Scraping these up after adding the liquid should take care of this, or only cook the veggies until translucent and not brown (just a couple of minutes). Make sure none of the veggies and spices stick to the bottom of the liner. Another thought is maybe some of the liquid evaporated if the lid wasn’t put on immeadiately? That could possibly cause less water to actually be used to cook the rice and result in a burn notice. Although, the recipe technically calls for more liquid than needed (based on the Instant Pot guidelines), so my thought is the bits could be the issue. Another thought is the broth may have been really thick (some stock/broth can be very thick versus liquid). Maybe that could be an issue. What happened once the burn notice came on? What size is your Instant Pot? I’m sorry this happened to your dinner–that’s really frustrating. I’ve made this recipe so many times, and want folks to experience the same successful results. Thanks for reaching out. I hope we can figure out what caused the issue. I also had the burn notification come as soon as the instant pot came to pressure and started the 8 minute countdown. I followed the recipe exactly, made sure i “deglazed” the pot with the broth after sautéing the vegetables, and put the lid on right away once all the ingredients were added. I allowed it to continue cooking because the instant pot functions at a lower heat when the burn notification comes up, but it never ended up coming to pressure and when it finished, the rice was cooked but the chicken wasn’t. Hey RM, I’m sorry that happened to you. Are you using the 6 quart or 8 quart pot? I have also had the same problem. I made this the first time and it came out great. The 2nd time it started counting down before it came to pressure and I assumed user error (which I haven’t ruled out 🙂 ). I just made it again and had the same problem. I’m using a 6 qrt pot. I’m excited to try this recipe because it looks amazing! However, anytime I attempt to cook a full meal (such as chicken AND rice, or chicken sausage with rice) in the instantpot it never comes to pressure or gets done. 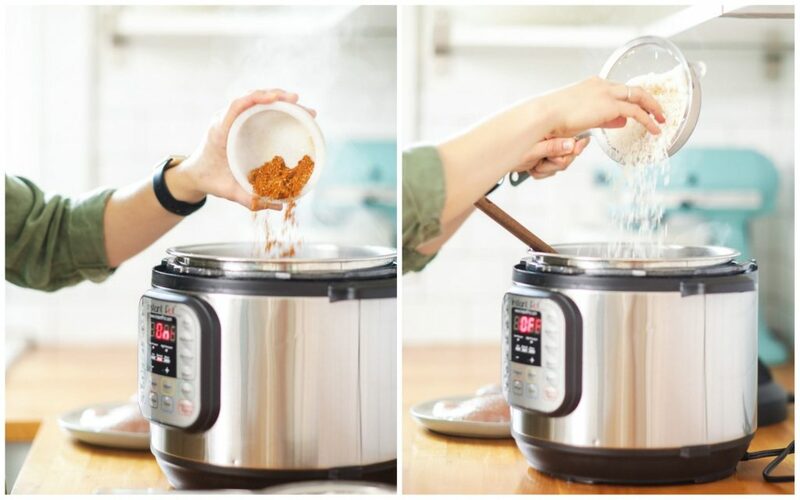 I’ve noticed you said to put the chicken on top of the rice and not to mix it in… is this the trick to getting the full meals come to pressure in the instant pot? Thanks! Hey Sarah, Yes, that’s the trick! I tried this recipe last week and it was a total success! Easy and quick to assemble but full of flavors, definitely a new staple here. Do you know if I can make it without chicken for those meatless nights ? should I change the amount of liquid ? Thanks for all the great IP recipes ! Yay, Charlotte, I’m so glad you’re loving the chicken and rice, and that it’s become a new staple for you. I think you could remove the chicken and make a delicious rice dish. Personally, I would keep the water amount the same. Let me know if you try it. So many of your instant pot recipes look delicious, like this one! Are you able to offer slow cooker conversions or ideas for those of us without instant pots? Hey Kera, Thank you. Adding a slow cooker option is a great idea. 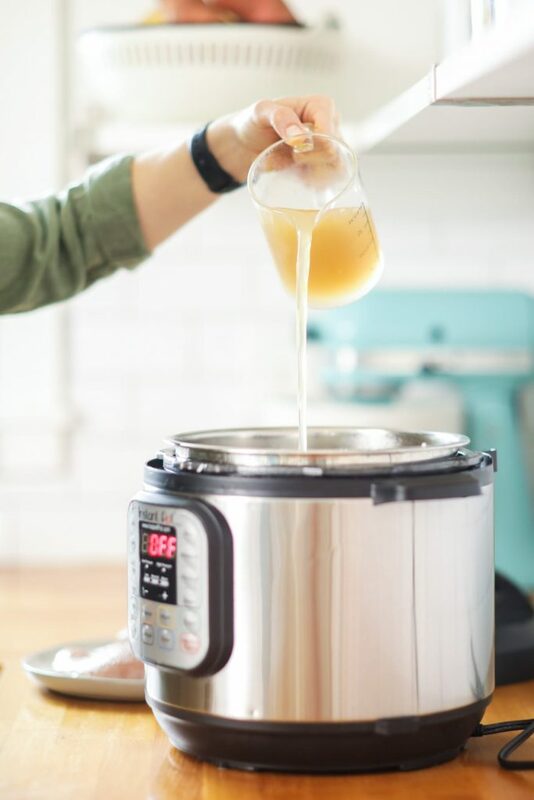 Many of the recipes are written specifically for the Instant Pot because of how the pressure cooker works. 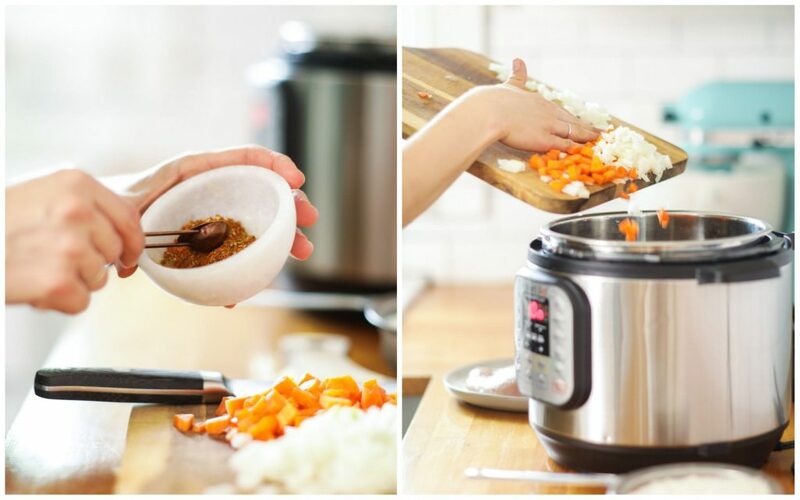 For example, this recipe probably requires more liquid in a slow cooker because the instant pot doesn’t require what most of us are used to when cooking rice on the stove-top. Other recipes, like the meatballs and sauce would probably work in the slow cooker–maybe 3-4 hours on high? or 6 hours on low? I’ll try to note in the future if a slow-cooker option is available. Made this for dinner tonight, delicious and everything was cooked perfectly. My chicken was still a little frozen, so I set the cook time to 12 minutes. Perfect! Made this tonight and even my picky eater liked it! 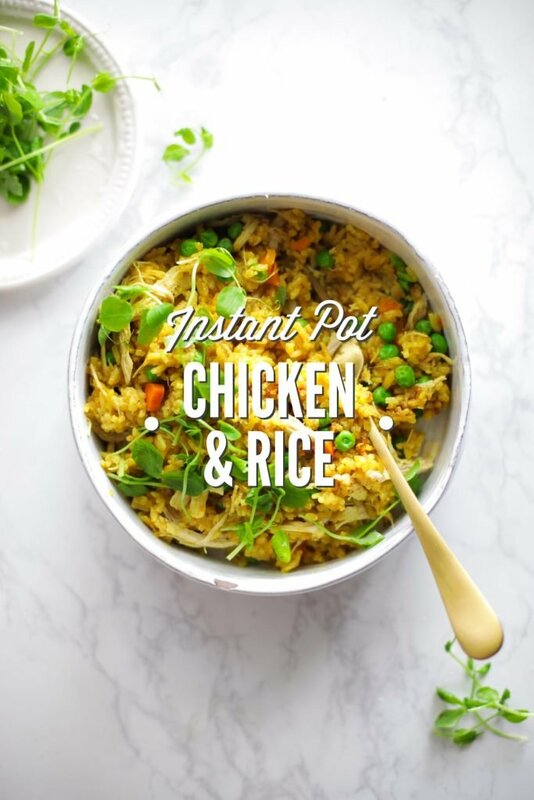 It will be on our rotation of favorite instapot meals. That’s so great to hear, Amy! Hi! Can I use brown rice? How would that affect the cooking time? Thank you! Hey Cristy, Brown rice needs to cook for 22 minutes, which is much longer than the chicken needs to cook. You could try it, but the chicken may be overdone. I made this tonight & it is a new family favorite! Yay, Cari! I’m so glad you loved it. This is the first meal I ever made in my instant pot and it turned out delicious!! I do wish you would include nutritional information, but still, this recipe is a keeper!! Hey Kathy, I’m so glad you enjoyed it! Congrats on your first IP meal. We choose not to share full nutritional information because we want to focus on real food as nourishment versus counting numbers, but we can provide specific numbers when requested. Is there a specific number you’re looking for? This is by far my family’s favorite instant pot recipe. So flavorful! I’m so happy to hear that, Chardea! I just made this exactly as stated and it was AMAZING. The chicken was super juicy and pulled apart so easily. I don’t know if this helpful for anyone else, but I have a pretty small instapot and it all fit just fine with room to spare. That’s awesome, Nicole. Thank you for sharing and I’m so glad you loved the chicken and rice :). I can’t wait to make this in my new I P. Can you use boneless skinless chicken breats instead of thighs, as we only like the white meat? Also, what about using yellow rice? Thank you so much for your recipes. You definitely can use breast but it will probably turn out more dry. With the rice, all rice cooks differently so its hard to tell. Let me know how it turns out for you if you try it. Made this tonight and it was fabulous. The cumin gave it a different flavor we all loved.